Is a Career Working With Animals Right for You? Many people casually dream of working with animals—training dolphins, doing veterinary work, grooming pets, or opening an animal related service business. How can you determine whether an animal related career will be a good fit for you? The best way to begin is to fully research your options, realistically evaluate your skills and talents, and gain hands-on experience and education in the field. The first step is to determine what specific types of animals you are primarily interested in working with and then investigate the potential career options related to those animals. The animal career list on this site is a great place to start looking for ideas, and there are many resources available for research online and in library reference guides. Don’t forget careers that are animal related but don’t involve hands-on contact with animals. Career titles such as animal writer, zoo administrator, pet insurance sales representative, and veterinary pharmaceutical sales representative are just a few examples of positions which may not offer direct animal contact but will still allow you to be very involved in the animal industry. Next, you should make a list that details your personal strengths and weaknesses, your prior animal related experience, and specific skills that will be useful in the careers you are considering. You should take a look at the U.S. Bureau of Labor Statistics (BLS) website which lists the skills required for a wide variety of animal-related careers. It isn’t the end of the world if you don’t have a skill that is necessary for a particular career. Internships, volunteer experience, work experience, and formal education can teach you what you will need to succeed. You’ve heard it time and time again: there is no substitute for hands-on experience in the animal industry. In many cases, extensive experience may be valued even more highly than formal education. While looking into potential careers, you should pursue some hands-on experience to get an insider’s look at possible roles. At the same time, you will be gaining valuable experience to list on your resume later (even if you decide that the specific career path isn’t the ideal one for you). 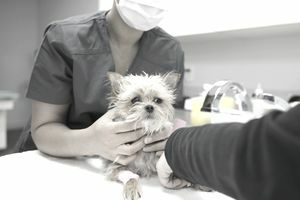 Those interested in a position in veterinary medicine, for example, should seek a position at a small animal clinic or ride along on rounds with a large animal veterinarian. If no regular volunteer or work position is possible, inquire about shadowing a professional for a day or a week to learn more about their career path. Internships are another great way to gain hands-on experience that can prepare you for an animal career. A wide variety of experiences are available in areas such as pre-veterinary medicine, marine mammals, veterinary pharmaceutical sales, wildlife rehabilitation, zoo animals, animal behavior, animal nutrition, and the equine industry. These experiences will enhance your resume and may also be eligible to count for college credit. If you think you might be interested in working with animals, it is important to begin pursuing an education that will be applicable to animal careers as early as possible. High school classes in biology or chemistry are a great foundation. A much greater variety of coursework will be available at the college level including animal science, anatomy and physiology, genetics, reproduction, nutrition, behavior, and more. Taking a variety of animal-related courses in college can help you figure out which specific career path interests you the most. There is no need to immediately declare a specific major; many students feel things out for their first year in college and make a final decision later in their sophomore year. The final step is to be painfully honest with yourself as you determine what salary level you could be satisfied with. Many animal related careers have a relatively low level of monetary compensation and require a great deal of hard work and commitment. Relatively few positions carry high dollar salaries, especially when you are new to the field. Some candidates do not view money as a primary concern in deciding which career to pursue, but you need to be realistic about your needs when deciding whether or not a career’s salary will be able to satisfy your financial obligations. If you are sure that you will never be able to make it on a lower salary, you should investigate options that offer higher compensation.